“It’s 2:30am again!” That is a frequent saying of mine the past four weeks, usually followed by a thought of, “I should have went to bed earlier.” 2:30am, that’s the time my work begins in the day. I am the current moth intern here at UGA Costa Rica and every morning I wake up at 2:30am to venture out around the campus to check two light traps for moths! Hundreds of beautiful moths filling the light walls and my mission is to take a photo of every one of them. Moths are a wonderful group of animals to work with: you can trap them with light, completely harmless, and their colors, shape, sizes vary from individual to individual. After the moth photo shoot I head back to bed and get maybe 2 or 3 more hours of sleep. I wake up for breakfast around 7:30am, and then I’m off to the GIS lab to upload the photos and to identify them. Usually I am in there all morning, then after refueling with a healthy lunch I’m usually doing several different things. Sometimes I head back to the lab for some more identification work, and other times I enjoy the afternoon off. That can mean doing things with other interns, reading, practicing Spanish, working on other research projects, or doing some fiction writing. Eventually dinner rolls around and after it’s usually a fun evening hanging out with the other interns playing an intense game of cards, watching a movie, or just talking on the front porch of the main building. At about 9pm I head to bed, knowing I probably should head to be earlier, and then it starts all over again, waking up at 2:30am. It sounds like it would be horrible to wake up in the middle of the night every day but here are just two examples of the amazing creatures with which I get to share the night. I know, they are beautiful, right? It’s ok you can pick your jaw up off the floor now. I’ll fill you in on where you can go to see more amazing moths like these two. The database, called discoverlife.org, was created by Dr. John Pickering of the University of Georgia. It is a free online tool to share usable and valid data with those who have an interest in using that said data. I upload all the photos I take onto this database and then identify the individuals at least to family, however I do my best to get them identified to the species level. 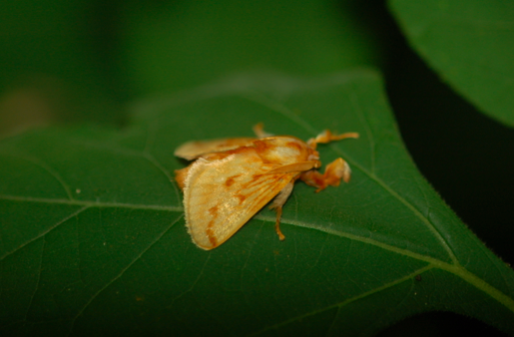 This project allows us to produce significant data of the moth populations here at UGA Costa Rica in San Luis de Monteverde, and the data spans across a large amount of time so future questions can be addressed regarding moth populations. If you are interested in contributing, you can! No matter where you are all you need to do is visit discoverlife.org, contact the administrators to set up an account, set up your light trap, and get that camera ready…it’s that easy! As for me, I’m planning future experiments to expand the potential knowledge that can be gained. It sounds like a challenge but you know what they say, “there ain’t no rest for the wicked”. Pura vida and good night!